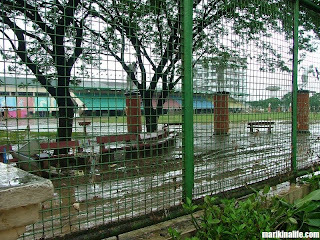 The Marikina Sports Center is one of the most visited multipurpose centers in Marikina. As early as five in the morning, people of all ages come to jog around the olympic sized track and field. The field is also used for non-sports activities like concerts, religious meetings, anniversary celebrations and other various events as the bleachers alone can hold thousands of people. 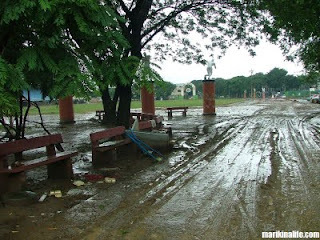 Unfortunately, the Marikina Sports Center wasn't spared from the floods brought about by Typhoon Ondoy. 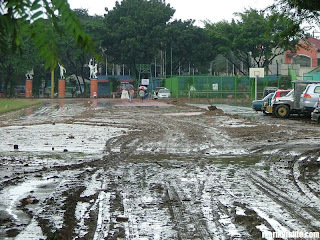 Because of this, the center grounds have been filled with mud inches thick and need to be cleaned before the Sports Center can resume operations. The new Sports Center Building of the Sports Complex facing the Marikina City Hall is currently being used as storage and delivery for relief goods for the city.